If you’ve read The Wind in the Willows you’ll know from the title of this blog, which animals have joined us on the farm. Richard sheepishly returned from the auction this morning saying he had bought me a present and I that I had to promise not to be upset. He popped the boot on the car and there were four little eyes looking back at me. Admittedly, at first peek I said ….”awwww lambs”… but luckily not out loud. They are actually baby goats. 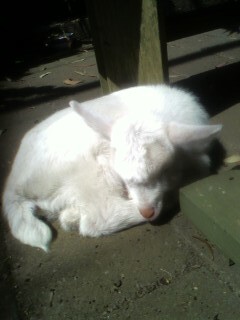 It’s not that I can’t tell a lamb apart from a goat, but I could only see white faces and cute eyes poking out. I guess I was close enough to keep my farmer credibility intact? We have called them Tansy (who I named after the herb) and Tara (who Richard named after a friends human kid). 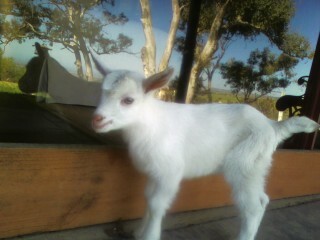 Don’t ask me why, but I felt an overwhelming urge to name a little girl goat after a herb or wildflower. Goats seem to be so symbolic of the wild, untamed, unruly chaos of nature – embodied in the great god Pan of course. In their behaviour, they are very lamb like anyway, apart from emitting goatish wee and poo pellets of course. 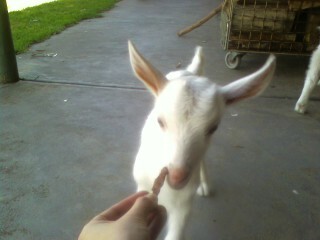 They make the funniest noise and have a lamblike skip/jump skittish dance. They sit on your lap, drink from a bottle and follow us around on wobbly goat legs. It’s not fair to call them lamblike and bring their goatishness into question, but if you imagine a 10 day old lamb with clumsy hooves, you’ll get the idea. 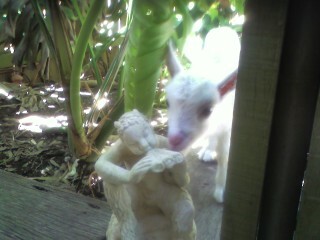 I felt that I had to test their interest in my garden statue of Pan, the goat god, who’s calm austerity might mike a good goat role model. I think that probably made them feel at home and that the great god of goats was looking after them. Yes yes, we know they eat *everything*. We’ll worry about that very soon, for now it’s simply nutritious enough to be in love with them.